The Nationals entered the preseason as massive favorites in the NL East. They'll regularly face the Phillies and Braves, which should pad the ol' win column. Spring injuries to Anthony Rendon, Jayson Werth, Denard Span, and Casey Janssen will strain the roster. For now, the club has sufficient depth to weather the storm. The rotation is the best in baseball. Actually, it looks like the best pitching staff since the historic 2011 Phillies. The entire rotation is comprised of fantasy giants. Expect to pay a steep price to own them. Scherzer is the most expensive. After posting above 10.00 K/9 for three seasons in the AL, he'll move to the weakest NL division. 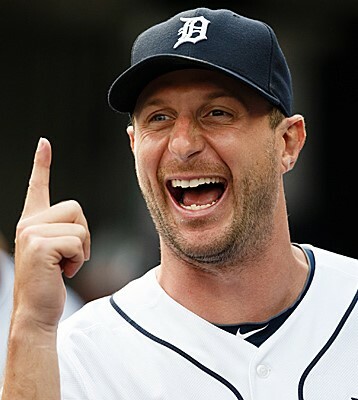 A healthy Scherzer should easily be among the top five starters. On the surface, Strasburg looks like he can be even better than his 3.14 ERA. His 10.13 K/9 and 1.80 BB/9 could support a mid-2s ERA. His 94 mph is an easy plus pitch, and it's complemented by a plus-plus changeup and plus curve. He'll also mix in an adequate sinker and borderline elite (but rare) slider. He also comes with a top five price tag. Just outside the top 10, you'll find Zimmermann. He was never supposed to be this good, but he outpitched Strasburg last year. His repertoire consists of a 94 mph fastball, plus slider, and plus curve. He'll also mix in a rare changeup. Unlike Strasburg and Scherzer, Zimmermann only manages about 8.00 K/9. The lower strikeout rate limits his fantasy ceiling. Fister is better in the real world than fantasy, which is why Gonzalez is selected 30 picks before him. For roto owners, Fister's low 5.38 K/9 isn't fully offset by an above average ERA or WHIP. In most leagues, you'll need to pair him with a reliever like Aroldis Chapman to compete for strikeouts. H2H owners can be more aggressive with Fister. Gonzalez was once the Nationals ace. He's still basically the same pitcher, but he's been pushed down to the fifth spot. With Gonzalez, you're buying about 9.00 K/9, occasional trouble with walks (career 3.90 BB/9), and a mid-3s ERA. He has the ceiling of a top 15 starting pitcher, but he's very inconsistent. As the 29th pitcher off the board, he can be a mid-draft steal. For some clubs like the Rockies, Diamondbacks, and Red Sox, Tanner Roark would be considered the ace. For the Nationals, he's a long reliever. He induces weak contact with an above average infield fly rate. From a fantasy perspective, he's a Doug Fister clone with a slightly better strikeout rate. Blake Treinen is the next name to watch after Roark. Speaking of clones, Treinen is very similar to Henderson Alvarez. His fastball plays up in relief, but the club prefers he remain stretched out as a starter. They'll eventually need him. Storen gave us a scare a few days back when he was removed from an appearance. It turns out he had a foot blister. The succession plan is unclear now that Janssen is on the shelf. Aaron Barrett, Craig Stammen, and Treinen are all options. Storen will be available for opening day, so keep an eye on who assumes eighth inning duties. He uses a four pitch repertoire headlined by a 94 mph fastball. None of his pitches are elite, but the combination produces strong results. His 7.35 K/9 last season was not particularly helpful for fantasy owners, but strong command led him to a 1.12 ERA. He appears to have experienced luck with hits and home runs allowed, so expect a mid-2s ERA. The Nationals will be without three of their top hitters for the start of the season. Of those, Anthony Rendon's steady bat is the biggest blow to fantasy owners. His dual eligibility at second and third base and five category production made him a popular target this spring. He'll miss at least a month with a sprained MCL. When he returns, I wouldn't expect many stolen bases. A healthy Rendon is a force at the plate. He's a high contact hitter with 20 home run power, above average plate discipline, and a strong supporting cast. Also missing Opening Day is Werth. Entering his age 36 season, he remains a great five category producer. He's only expected to miss a couple weeks, but his ADP is way down around 170. When healthy, he can pop 15 to 20 home runs with around 10 stolen bases, a high average, and good run production. Among the actually healthy hitters, Ian Desmond and Bryce Harper are the top names to watch. Desmond has three straight 20/20 seasons, but deteriorating plate discipline could eat into his value. His average dropped to .255 last season, and a rebound is not guaranteed. He's the 21st overall pick in NFBC. You can grab players like Josh Donaldson, Hanley Ramirez, and Michael Brantley around the same spot. If he weren't a shortstop, he'd be going later. As the 29th overall pick, fantasy owners are still betting on a breakout season from Harper. He missed a big chunk of 2014 and hit just .273/.344/.423 when healthy. For most players, that's a solid line. For Harper, it's a major disappointment. He still owns a dynamic skill set with 30 home run upside. I'm not sure I can justify passing on stable assets like Yasiel Puig, Ryan Braun, or Starling Marte. If you're looking for value picks, the names to watch are Ryan Zimmerman and Wilson Ramos. Zimmerman is a perennial candidate for 20 home runs and a .275 average. He'll hit in the heart of the order, so his run production should be a plus too. He'll be eligible at first base, third base, and the outfield in most leagues. He's very familiar with the trainer's table, so don't bet on him as your only third baseman. For owners in two catcher leagues, Ramos is a nice second backstop when he's healthy. He's frequently on the disabled list, which is why he's available at pick 183 (and trending down). A full season could include 15 home runs, some run production, and a decent average. I've seen him go well after pick 200 in some leagues. The Nationals are number one in our power rankings. They notch the top spot in large part due to their inept divisional rivals. However, the ranking is well deserved. The rotation profiles as the best in baseball by a wide margin. The lineup could be explosive when at full strength. The only obvious weakness is a shallow bullpen, but the rotation will ensure that it's seldom overworked.